Drive Electric Minnesota’s signature orange Nissan LEAF made an appearance in Duluth for the 2017 Energy Design Conference, the latest stop on our ongoing journey to EV visibility. Minnesota Power hosted the conference, which ran from February 20-22nd. A wide variety of exhibitors attended the conference to show off their energy-saving and energy-generating products. We set up our Nissan Ride and Drive table in a room reserved for electric transportation exhibits. Across from us was Symphony Boat Company, displaying two of its Duluth-made electric boats. To our right was a representative from ChargePoint, showing off one of their DC fast chargers. In the middle of the room, with doors open and headlights on, stood a Tesla Model S P90D that Jukka Kukkonen, founder of MN Plug-in Vehicle Owners Circle, brought to display. When conference attendees wanted a break from listening to presentations, they had the chance to imagine themselves cruising Lake Superior in a sleek electric boat, see the impeccable details of a Tesla up close, and of course, get behind the wheel of our Nissan LEAF. Everyone who tested the LEAF had good things to say about the experience—and great things to say about the price thanks to the deal that Nissan is offering through March 31st. I’m no car expert, so I let Eric Heineman from Nissan answer the more detailed questions about the LEAF’s features. I did, however, offer a personal anecdote to people wondering about the practicality of owning an electric vehicle. What happens when you want to drive outside of the city you live in? It is possible and is becoming easier all the time. 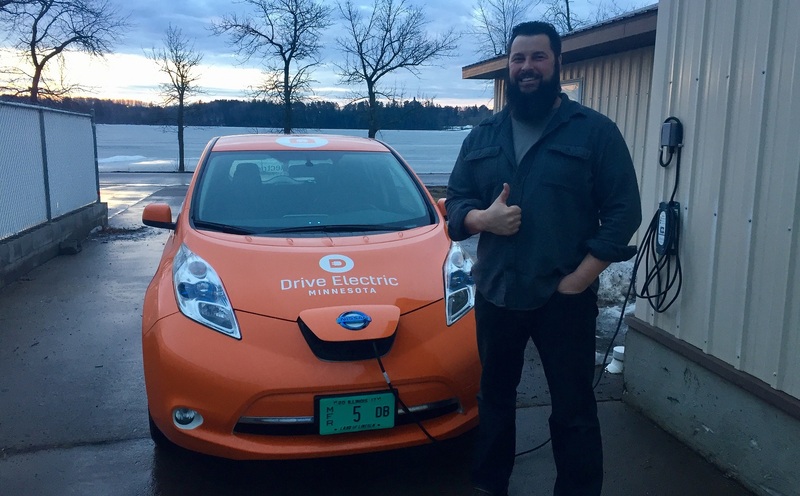 I drove the LEAF from Minneapolis to Duluth for the conference (with some help from GPI’s Brendan Jordan). There are 154 miles between Minneapolis and Duluth by way of I-35, which means that the LEAF’s 107-mile range wouldn’t get us there without charging along the way. A couple years ago, it simply would not have been doable in a single day. Then, in October 2015, ZEF Energy partnered with Family Pathways Thrift Store in Pine City to install a DC Quick Charger in the store’s parking lot. Pine City is 68 miles from Minneapolis and 86 miles from Duluth, making it the perfect stepping stone between the two cities and opening I-35 as a corridor for EV travel. Brendan and I enjoyed breakfast at Cabin Coffee while the LEAF charged, and then we were on our way. Now, this was my first time driving an electric vehicle, and I should say I was a bit worried. To me, there seemed to be little difference between the 86 miles from Pine City to Duluth and the LEAF’s maximum 107 miles. I drove cautiously, using energy-saving measures like staying below the speed limit and only using seat and steering wheel heat. We made it to the charger in Duluth’s Transportation Center parking garage without a hitch and with twenty miles to spare. Minneapolis to Duluth may not exactly be a long-distance road trip, but the implications are big. We are seeing the EV infrastructure in Minnesota expand before our eyes. In fact, when I drove back to Minneapolis on Wednesday, I could stop in Moose Lake at a Level 2 charger that hadn’t been there the day before. Moose Lake Brewing Company installed the charger hoping that it would help make their new brewery a destination along I-35. One of the owners, Paul, told me that they had seen four EVs that afternoon. Even though I couldn’t drink and drive, he invited me in for a root beer and free pizza, their Wednesday special. If you’re in the metro area thinking about getting an EV but can’t bear to give up your trips up north, don’t worry. Places like Moose Lake Brewing Company and Family Pathways Thrift Store are connecting the dots and opening Minnesota to easier EV travel.